INCHEON, Republic of Korea, 8 Oct – Limiting global warming to 1.5oC would require rapid, far- reaching and unprecedented changes in all aspects of society, the IPCC said in a new assessment. With clear benefits to people and natural ecosystems, limiting global warming to 1.5oC compared to 2oC could go hand in hand with ensuring a more sustainable and equitable society, the Intergovernmental Panel on Climate Change (IPCC) said on Monday. “One of the key messages that comes out very strongly from this report is that we are alreadyseeing the consequences of 1°C of global warming through more extreme weather, rising sea levelsand diminishing Arctic sea ice, among other changes,” said Panmao Zhai, Co-Chair of IPCC Working Group I.
of 1.5°C, whereas virtually all (> 99 percent) would be lost with 2oC. development, and efforts to eradicate poverty. warming to 1.5oC compared to 2oC, or more. The report finds that limiting global warming to 1.5°C would require “rapid and far-reaching”transitions in land, energy, industry, buildings, transport, and cities. Global net human-caused emissions of carbon dioxide (CO2) would need to fall by about 45 percent from 2010 levels by 2030,reaching ‘net zero’ around 2050. This means that any remaining emissions would need to bebalanced by removing CO2 from the air. “Limiting global warming to 1.5°C compared with 2°C would reduce challenging impacts onecosystems, human health and well-being, making it easier to achieve the United NationsSustainable Development Goals,” said Priyardarshi Shukla, Co-Chair of IPCC Working Group III. “This report gives policymakers and practitioners the information they need to make decisions thattackle climate change while considering local context and people’s needs. The next few years are probably the most important in our history,” she said. Global Warming of 1.5oC is the first in a series of Special Reports to be produced in the IPCC’sSixth Assessment Cycle. Next year the IPCC will release the Special Report on the Ocean and Cryosphere in a Changing Climate, and Climate Change and Land, which looks at how climate change affects land use. 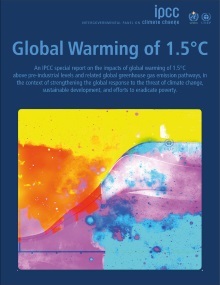 The Summary for Policymakers of the Special Report on Global Warming of 1.5oC (SR15) is available at http://www.ipcc.ch/report/sr15/ or http://www.ipcc.ch. The Special Report on Global Warming of 1.5 oC , known as SR15, is being prepared in response to an invitation from the 21st Conference of the Parties (COP21) to the United Nations Framework Convention on Climate Change in December 2015, when they reached the Paris Agreement, and will inform the Talanoa Dialogue at the 24th Conference of the Parties (COP24). The Talanoa Dialogue will take stock of the collective efforts of Parties in relation to progress towards the long- term goal of the Paris Agreement, and to inform the preparation of nationally determined contributions. Details of the report, including the approved outline, can be found on the report page. The report was prepared under the joint scientific leadership of all three IPCC Working Groups, with support from the Working Group I Technical Support Unit. there is agreement in the scientific community, where there are differences of opinion, and where further research is needed. It does not conduct its own research. more than one working group and are shorter and more focused than the main assessments. The Methodology Report to refine the 2006 IPCC Guidelines for National Greenhouse Gas Inventories will be delivered in 2019. Besides Global Warming of 1.5oC, the IPCC will finalize two further special reports in 2019: the Special Report on the Ocean and Cryosphere in a Changing Climate and Climate Change and Land: an IPCC special report on climate change, desertification, land degradation, sustainable land management, food security, and greenhouse gas fluxes in terrestrial ecosystems. The AR6 Synthesis Report will be finalized in the first half of 2022, following the three working group contributions to AR6 in 2021.